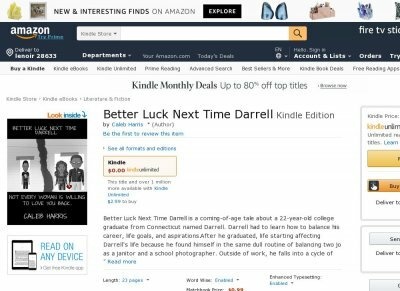 Better Luck Next Time Darrell is a coming-of-age tale about a 22-year-old college graduate from Connecticut. After he graduated, life starting affecting Darrells life because he found himself in the same dull routine of balancing two jobs as a janitor and a school photographer. Outside of work, he falls into a cycle of heavy drinking, manic depression, and ultimately, isolating himself from the real world and replacing it with the virtual world. However, in October, he met Anastasia. Anastasia changed Darrells overall perspective of life and gave him hope for the future. Its just too bad he lost her in December.